posts through online mode from 01-01-2019. 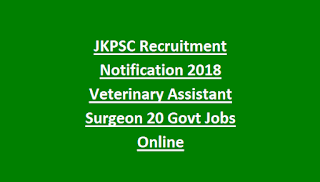 The official website of JKPSC for applying the Veterinary Assistant Surgeon posts is www.jkpsc.nic.in before closing date 23-01-2019. The educational qualification for this posts is candidates should qualified in B.V.Sc & AH. The candidates will be shortlisted based on performance in interview. For the other details of age limit, selection process, pay scale and how to apply are given below for the Veterinary Assistant Surgeon jobs in Jammu & Kashmir recruitment notification 2019. 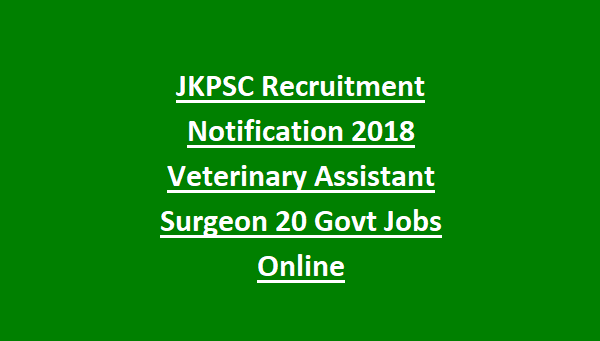 There are total 200 Veterinary Assistant surgeon posts are available in JKPSC recruitment 2018. The age limit for the candidates is in between 18 – 40 years as on 01-01-2019. For the Physically Challenged candidates the upper age limit is 42 years. And for the EX-s category candidates the upper age limit will be 48 years. The educational qualification for the Veterinary Assistant Surgeon (Animal Husbandry) is B.V.Sc & AH. The salary offered for the selected candidates is Rs.52700 – 166700/- for the posts of Veterinary Assistant Surgeon posts in Jammu & Kashmir PSC Recruitment 2018. The Examination fee for the Veterinary posts of JKPSC recruitment 2018 is will be based on category wise. There is no fro the PHC category candidates. The application fee for the candidates belongs to General category is Rs.800/-. The application fee for the candidates belongs to Reserved category is Rs.400/-. For Exam pattern and syllabus candidates can refer in official website of JKPSC. Interested candidates can apply through online mode only. The official website for applying Veterinary Assistant Surgeon jobs in JKPSC is www.jkpsc.nic.in. The last date for apply of online application form and online fee is 26-10-2018. Last date for Submission of hard copy of application form along with all relevant documents is 28-10-2018.